Do We Need A Sturdier Racehorse? 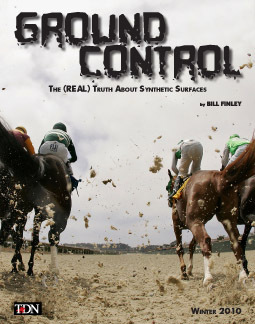 Are synthetic racing surfaces good for horses, or bad? Are there fewer breakdowns, or more? Are they the future, or something that belongs in racing's past? 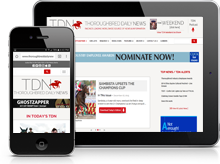 The TDN sits down with the people at the forefront of the synthetic surface debate--those who love it, and those who hate it--and gets to the heart of one of racing's most controversial subjects. The answers may surprise you. Part travelogue, part business story, "South Africa: Racing's Best-Kept Secret," will have you yearning to visit the country for one reason or another. 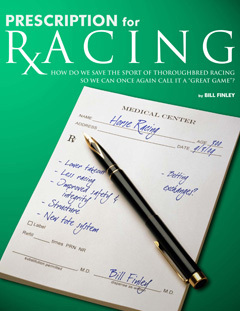 We welcome you to the first edition of the Thoroughbred Daily News's new magazine series with our Summer, 2009 installment--Prescription for Racing. This piece offers a 37-page look at what 11 of the top industry leaders and thinkers feel are the most important elements required to save the sport of Thoroughbred racing. It is sponsored by TVG and Keeneland.